(mainly fossil fuel) emissions (F-poss); fluxes from land use and land use change (FLULUC) excluding managed sequestration; managed terrestrial and ocean biological carbon sequestration (FSq); and engineered disposal of CO2 in land or ocean reservoirs (FD¡p). Fluxes from the atmosphere (uptake to land and ocean pools) are negative. All these fluxes are influenced by human activities, in the sense that they are different from what they would have been without human intervention in the carbon cycle. We can, however, distinguish different levels of human influence. Some fluxes are linked with identifiable human actions as proximate causes: for instance, fossil-fuel burning, land clearing, or managed CO2 sequestration. Others are influenced by human actions only through changes in the Earth system, such as rising atmospheric CO2, rising average temperatures, changes in precipitation patterns, and changes in nutrient cycles. The distinction is not absolute, but it is important because the directly human-influenced fluxes are candidates for carbon management. Therefore we identify some fluxes in equation (1) (Fposs, Fluluc, F& , FDp) as "directly influenced" by human activities and others (F^ind, Focean) as "indirectly influenced," with the fluxes in former group being actually or potentially directly manageable. Most of the fluxes in equation (1) depend on the atmospheric CO2 concentration. These dependencies (often called "feedbacks") are both direct and indirect. 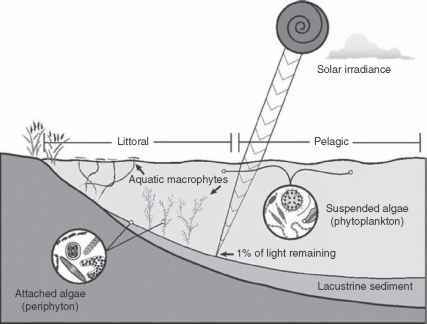 The direct feedbacks occur through physical and biological mechanisms like CO2 fertilization of carbon uptake into terrestrial and marine pools, while the indirect feedbacks occur through climate properties like temperature, light, precipitation, and ocean circulation, which influence the fluxes. Climate, in turn, is responding to a range of "climate forcings," including CO2 and non-CO2 greenhouse forcing, solar variability, and vol-canogenic aerosols. The result is that the fluxes in equation (1) depend on the atmospheric CO2 level (CA ) both directly through physics and biology and indirectly through climate. Through this dual set of dependencies, the behavior of the fluxes in response to rising CA can potentially change drastically as CA itself rises; for example, negative (stabilizing) feedbacks can be replaced by positive (destabilizing) feedbacks through mechanisms like a shift in the land-air flux toward CO2 emission as respiration increases with warming, or a substantial change in the oceanic thermohaline circulation. Such possible changes in system behavior, or "vulnerabilities" in the carbon-climate-human system, are associated with nonlinearities or thresholds in the relationships between fluxes (F), atmospheric CO2 (CA), and climate (see Gruber et al., Chapter 3, this volume, for more discussion of vulnerabilities). Their significance here is that they have major implications for efforts to stabilize atmospheric CO2. Table 6.1 gives current global average values for quantities in equations (3) and (1). Of course, these averages mask huge regional differences (Romero Lankao, Chapter 19, this volume). • F^isp'' engineered disposal of CO2 in geological or oceanic repositories. The other two quantities (P and g) are not regarded here as carbon mitigation strategies. That is, we do not consider options for reducing fossil-fuel emissions by lowering population (P) or economic well-being (g). Nakicenovic (Chapter 11, this volume) discusses trends in both variables. We turn now to the stabilization challenge. A stabilization trajectory for direct-human-induced emissions, FStah(t), is a (non-unique) trajectory for the directly human-influenced carbon flux, FDHI(t) = Fj0gs + FLULUC + F^ + F^p, such that the atmospheric CO2 level (CA) is eventually stabilized (dCAIdt = 0) at a given target level (Wigley et al. 1996; Houghton et al. 2001, Figures 3.13 and 9.16). Examples are shown in Figure 6.1. Stabilization trajectories are determined by the feedbacks between the fluxes in equation (1), particularly FLand and F0 , and the atmospheric CO2 level (CA). Stabilization trajectories have several important features: first, FSuh(t) increases initially and then peaks and declines to near zero in the far future (and for low stabilization CO2 targets FStb can actually become negative). Second, the lower the stabilization CO2 target, the sooner and lower is the allowed emissions peak. Third, short-term trajectories of FStah(t) (over the next decade) do not depend much on the selected stabilization CO2 target. Fourth, it is crucial to note the implications of the vulnerabilities associated with possible positive feedbacks in the relationships between CO2, fluxes, and climate. These vulnerabilities add considerable uncertainty to stabilization trajectories, especially when the stabilization CO2 target is high. The higher the target, the greater is the magnitude of likely climate change and the greater the probability of carbon-climate feedbacks becoming important. In extreme cases, positive feedbacks could prevent stabilization from being achieved at all. A quite different picture emerges from consideration of the direct-human-induced C flux Fdhi (equation (3)), especially its fossil-fuel component. At present, fossil fuels represent about 85 percent of the 12 TW of primary energy generated by human societies (Table 6.1). Future human energy demand will increase substantially (though far from uniformly across regions and scenarios), in response to both increasing population (P) and increasing globally averaged per capita energy use (Epri IP = ge) associated with globally rising standards of living. If a significant fraction of this demand is met from fossil fuels, the trajectory for FDHI is likely to be far from that required for stabilization. 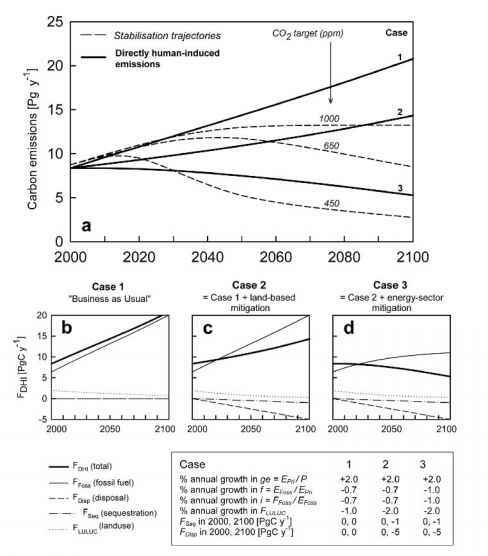 Emissions scenarios (Nakicenovic et al. 2000; Edmonds et al., Chapter 4, this volume; Nakicenovic, Chapter 11, this volume) give an internally consistent set of assumptions for the time trajectories of the quantities P, g, e, f i, FUjUjC, F^, and FDi^, which influence Fdhi . Under most (though not all) scenarios, FDHI (t) substantially exceeds the human-induced C flux required for stabilization, FSta/>(t). The difference FdHj(t) — Fsub(t) is called the carbon gap. Figure 6.1. (a) Scenarios for the directly human-induced C flux (F^ni) 'n three cases, compared with approximate stabilization trajectories (F$tay) for stabilization at 450, 650, and 1000 ppm (Wigley et al. 1996). (b, c, d) Carbon fluxes contributing to FDHi for Cases 1, 2, 3, respectively. Cases assume that per capita primary energy ge grows geometrically, f i and FLUIuuc decline geometrically, and F^ and Fdisf grow linearly, at constant rates shown in the inset table. Case 1 is a typical "business as usual" case approximating the IS92a scenario (see text). Case 2 includes major land-based mitigation. Case 3 additionally includes major energy-sector mitigation. achieve stabilization unless there is also major mitigation in the energy sector (Case 3). Our intention here is not to construct self-consistent scenarios like those described in Edmonds et al. (Chapter 4, this volume), but only to indicate the orders of magnitude of the terms in equation (3), their trends under simple constraining assumptions, and how those trends relate to stabilization requirements.